When Ewa Omahen met a woman at work who was in a state of despair over her son’s disabilities, she chose to reach out. 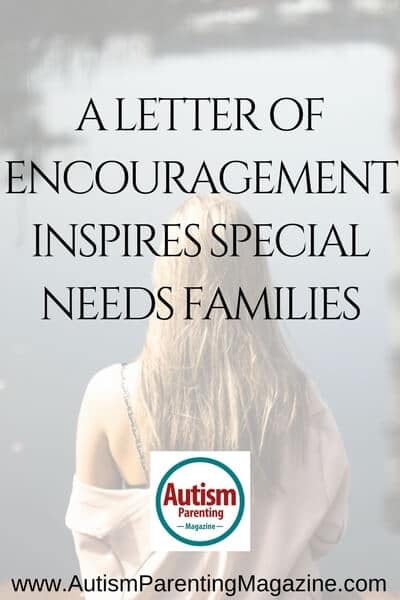 As a mother of a 15-year-old son with autism, Ewa well understood the challenges that go hand-in-hand with raising children with special needs. Take a look at the touching letter Ewa wrote encouraging the mother to always celebrate her child for the gifts that he brings. I know how hard it is to let go of dreams and expectations. The reminders of possibilities of what could have been and will not be abound wherever I look. My friends’ and family’s kids are growing up, graduating from high school then college, getting jobs, starting families. With every graduation celebration and every wedding we attend, I reminisce some more about what could have been and is not in the cards for us as a family. It is hard to let go of one’s plans and dreams. There are more tears, more sadness, more grief, more worries about our children’s future. In the midst of all this, I often neglect to celebrate my child for who he is. I do not notice the joy on his face of simply being, living in the moment, enjoying simple things. I grieve, yet he continues to look up to me with so much love, innocence, trust, and forgiveness. Each day, I make a promise to myself that I will try harder to celebrate the gifts he brings daily to me and to this world. I will get better at understanding his way of teaching me and others about patience, compassion, and unconditional love. Today I will stop and look more carefully into his eyes and once more ask for his forgiveness for my disappointment, sadness, and loss. I will take the time to notice the beauty, innocence, and light he brings into this world. Once again, I will thank him for the gifts he brings into my life. Today I will worry less and celebrate him more for the special gift that he is. Ewa Omahen is a resident of Novi, Michigan, and a mom of 15-year-old son with autism Patrick, who attends Northville Public Schools. He uses a communication app and sign language to communicate. Ewa works as a psychologist for Walled Lake Consolidated Schools. She is an avid advocate for all “differently-abled” children. Patrick and the students she works with continue to be sources of hope and inspiration. I love you how said that today you will stop and understand his way of showing love. That is so true. For everyone. I should stop expecting the usual social normative ways of showing love from my children and learn what ways they are showing me. Not only will I increase the love I have for my children, their love for me will increase as well because we have a deeper connection. I like Win Wins!